As woodworkers, carpenters or simply lovers of home improvement, there are often times when we not only have to build our projects, but we have to secure them as well. For example, what if you need powerful cabinet locks to secure your valuables or important documents. Or maybe you want to be absolutely sure that your exterior doors are burglar proof? Obviously, you’ll want to pick the best possible lock for the job. The problem with this is that there are so many different types of locks available and picking the right type of lock can be a hassle. Not to worry though. This article will guide you through the 5 most common types of locks and their uses, which will help you pick the perfect lock for any of your woodworking projects. Deadbolt locks are a common, effective and cost efficient way to secure most external doors. The locking mechanism revolves around a cylinder that runs directly through your door and has a keyhole on the outside. When the key is entered and turned, a bolt inside the cylinder moves sideways and protrudes into the door frame, locking the door. The strike plate, which is the rectangular metal piece in the doorframe, helps keep the bolt secure and prevents it from ripping through the frame when pressure is applied to the door (such as in the case of forced entry). Like mentioned earlier, deadbolt locks are mostly used for exterior doors because of their reliability. However, they can also be used very effectively for locking cabinet drawers and doors. They normally come in two types; single cylinder and double cylinder. A single cylinder requires just one key, which you only need when you’re outside the door. When you’re inside, there is often a knob you can turn to lock and unlock the deadbolt. A double cylinder, however, requires a key no matter what side of the door you’re on. These locks are used more often when the door has a window attached, and a burglar can break that window to gain access to the house However, double cylinder locks are also hazardous, because in the case of an emergency (like a fire), you would need a key to exit your own front door. Combination locks require a certain sequence of numbers, letters or symbols in order to be opened. The most common methods for entering this sequence are keypad entry and rotating dials linked to internal discs. 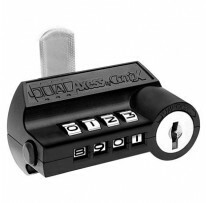 Combination locks come in various forms, including single dial, multiple dial and electronic. 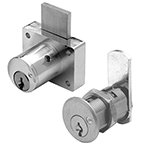 Single Dial locks use only a single combination dial that’s attached to a rod or spindle. When the dial is turned, that spindle interacts with various discs that are nestled behind the dial. Because of the spindle, these discs turn with the dial, and when all the discs are lined up perfectly, the lock opens. Combination locks are most often used for padlocks, school lockers and safes. Multiple Dial Combination locks, instead, use a handful of dials. Rather than a single dial turning every disc, multiple dials have to be set manually for the notches in the internal discs to line up correctly, opening the lock. Although there are many uses for multiple dial combination locks, the most common are bike locks, luggage and briefcases. Electronic combination locks usually have all the quips of a single dial combo lock, but differ in their sequence entry method. Rather than using a dial to enter the sequence, electronic combo locks employ a keypad that you use to enter numbers, letters or symbols. These are often found on safes, lockers and other secure containers. If you’re looking for something simpler, then cam locks are an excellent choice. These locks are usually on the cheaper side, with even the more advanced types typically costing under $20. The cam lock is made up of a cylindrical base that has a keyhole and a metal piece known as the cam that sits perpendicularly to the end of the base. When the key is inserted into the keyhole and turns, it turns the cam up or down. In the locked position, the cam is horizontal and fitted into a strike plate that’s attached to the frame of the door. But when the key turns the cam up or down, it frees itself from the strike plate allowing the door to open. These locks come with multiple types of cams with the most common being straight and hooked. Straight cams are simply a metal bar that fits into a strike plate. Hooked cams have a small hook in the end that latches onto an item not attached to the lock. Cam locks are typically used to secure cabinets, furniture and other types of smaller compartments as they work well in tight spaces. They are very common, come in different colors/styles and are easier to install than most locks. However, because of their simple nature, cam locks are not meant to secure highly valuable containers unless they are very large and sturdy editions. Even the stronger, more expensive cam locks can be broken into with some effort and expertise. Note: At Gadsden Hardware, we stock our deadbolt locks and cam locks in both disc tumblers and pin tumblers. The disc types are typically less expensive and less secure, whereas the pin tumbler locks provide higher security at a higher price. Although most of the locks discussed above come with some form of electronic variation, there are also purely electronic locks that help secure doors and cabinets in more high priority areas. Although we won’t get into the deep technical systems of these locks, they’re basically unlocked using a numerical keypad that’s mounted on the door or furniture being secured. This makes them the perfect keyless lock for situations in which more than one person needs access to the room or container being locked. Although the keyless lock system usually doesn’t cost very much, the actual installation of the system may require a security professional if you don’t have the right technical know-how. The most common applications of these locks are at offices, clinics, safes, high-security containers and any room that requires restricted access to enter such as in airports, hospitals, and banks. If you’ve been struggling to find a lock that will work with a glass door, then you’re in luck. There are plenty of different glass door locks available to meet your specific project needs. Most of them are even variations of the locks described above! Those seeking glass door locks usually want to secure backyard or patio doors with a view and therefore, many glass door locks are design-oriented, stylish and will fit in with the surrounding décor. Since glass doors often serve the purpose of creating a natural ambience in the home, they are usually not large, bulky or impenetrable. That way, these locks don’t interrupt the door’s design or get in the way when someone trying to open and close the door when it’s unlocked. It’s important to note that, for someone unexperienced in working with glass, installation, repair or changing of these types of locks may prove difficult. Glass door locks are most often used for patio doors, trophy cases or any other form of glass cabinet. - Cam style for hinged doors (requires a hole to be bored through the glass). - Combination (keyless) style for sliding doors and hinged doors. Less obtrusive than normal combo locks. - Ratchet style locks, which are meant for sliding glass doors. Require a key to open.